Obsidian's upcoming sci-fi RPG, The Outer Worlds, is set to release some time in 2019 on PC, Xbox, and PS4 – and we now have a 20-minute gameplay demo to pore over until it does. Released at the PAX East expo – where we also got an official Borderlands 3 announcement – the demo shows off the kind of character interactions and combat encounters you can expect to have in the highly-anticipated title. 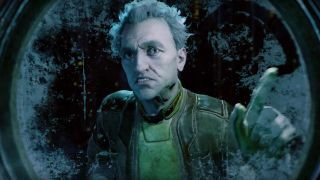 And so far, it looks like The Outer Worlds will be cramming in as much humor as possible. In the one location shown in the demo, robot-themed movie posters for 'Titus Androidicus' line the walls, casting directors applaud your bloodlust, and neon advertisements float through the city streets. The NPCs really lean into parody, rattling off the names of their favorite brands and speaking obliviously of their "odious interpersonal skills". Facial capture still seems slightly wooden in the demo (compared to the animations in The Outer Worlds announcement trailer) but there's a slick veneer to the character models and environments. Combat is full of bursts of color, and enemy corpses or items light up in your HUD to help see what can be looted or interacted with. You can see for yourself in the demo below, or check out everything else we know about the game in our The Outer Worlds hub. What's immediately apparent in the demo is the sense of chaos that enables players to make spur-of-the-moment decisions. "You can kill anybody and everybody you want," we're proudly told in the demo, and the playtesters indeed seem to take on guards or even quest-givers on a whim. A decent amount of time is given to your character's NPC companions, who can attack on command (with either a machine gun, or a feet-first jump attack) and have their armor or clothing customized to your specification. The weapons are equally wide-ranging, including everything from glowing scythes to branded grenade launchers – and even a magic (sorry, 'science') baton that shrinks civilians' heads. We only hope that character development and story aren't neglected in the name of freewheeling fun – but for now we're just excited to play a story-driven RPG that isn't afraid to let its players mess around.